One of my very favorite candies, TWIX, now comes in packages of bite-size pieces. 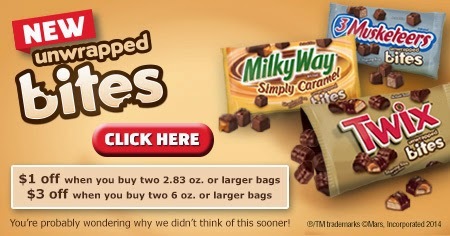 And if you are a candy lover like me, this is great news!! 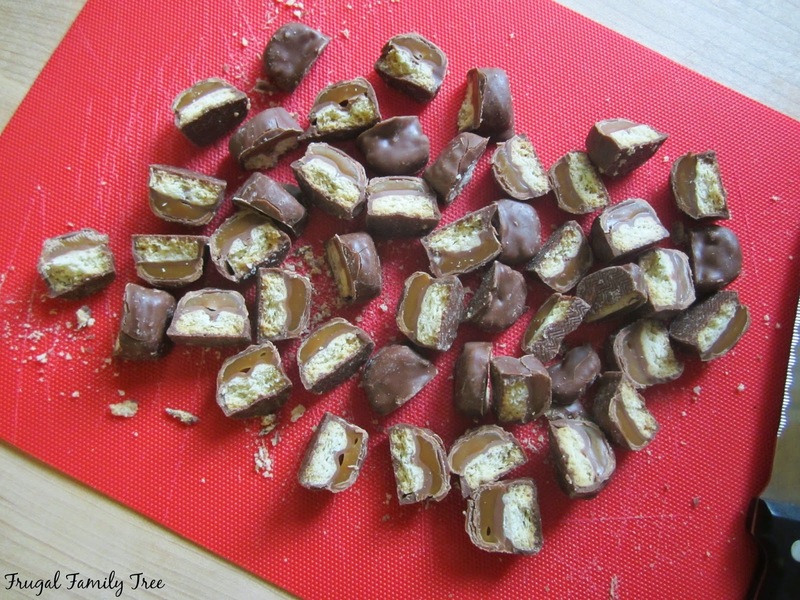 Of course I love eating my TWIX Bites right out of the bag, but I've also been having some fun with using candy in my baking recipes lately. 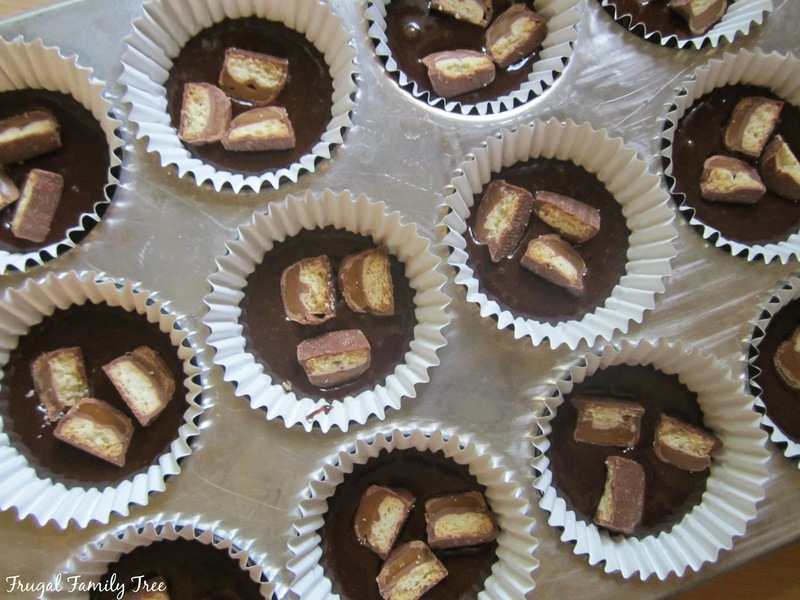 Brownies are a big favorite around my house, so I decided to pair my best brownie recipe with new TWIX Bites for a yummy treat that my whole family would love. I adore chocolate and so do my grandchildren. They quickly figured out that the TWIX Bites are the perfect size for those little fingers to pop right in their mouths!! I was grocery shopping at Walmart when I found the TWIX Bites, and I saw they come in Milk Way, Snickers, and 3 Musketeers varieties, as well. I bought a few bags, thinking these would be the perfect treat for our family movie nights. 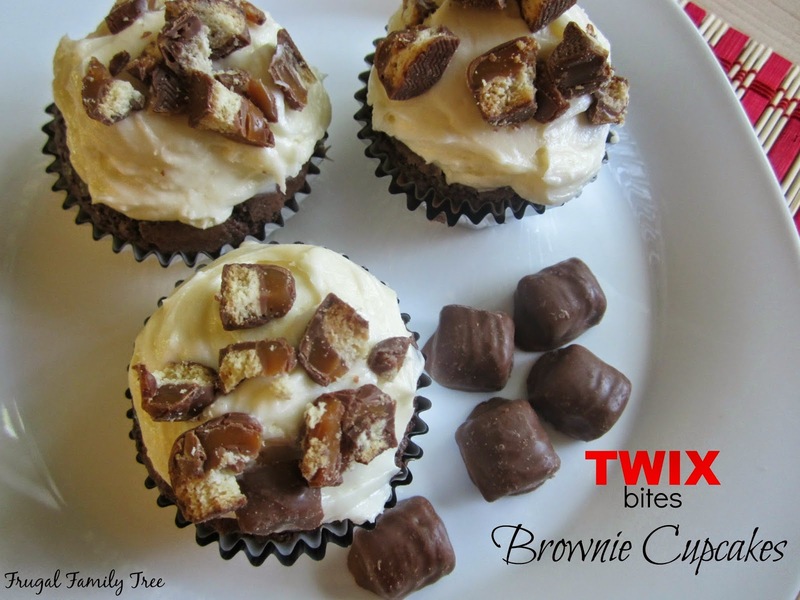 When I made my chocolate brownie cupcakes, the first thing I did was to chop up the TWIX Bites. Since they would be going inside the cupcakes and on top, I used the whole package to make sure they tasted really fabulous. I made my favorite, super-easy brownie recipe, and filled the cupcake liners about a third full. Then I dropped in three pieces of the cut Twix Bites, and then added more brownie mix. I filled the liners about 3/4 full because I like a big cupcake, and I'd rather have fewer and have them be big and fabulous, than more smaller ones. 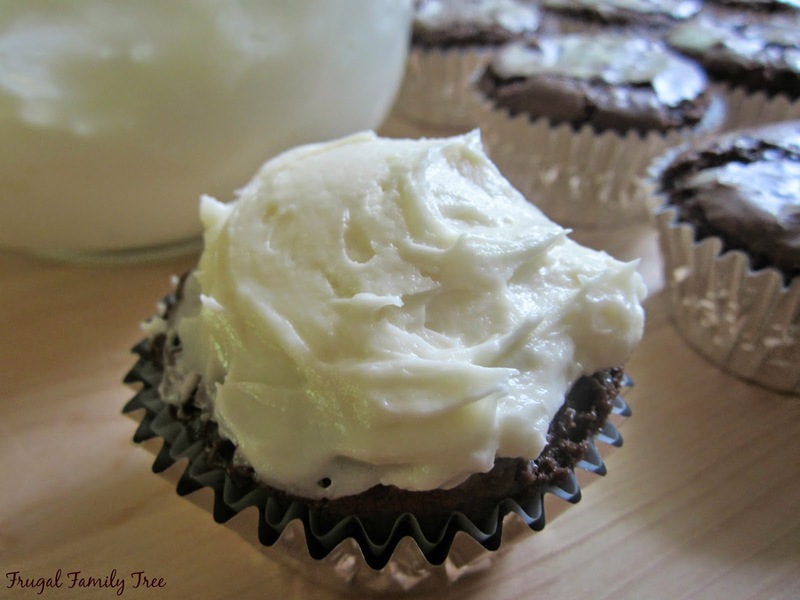 My cream cheese frosting recipe is from Martha Stewart, and it really is delicious. I use this frosting for so many baked goods, including cakes, carrot cake, and cookies. The brownie cupcakes came out of the oven and sank a tiny bit, but it turns out this just made them even more chocolaty. And they smelled so good!! Preheat oven to 350 degrees. 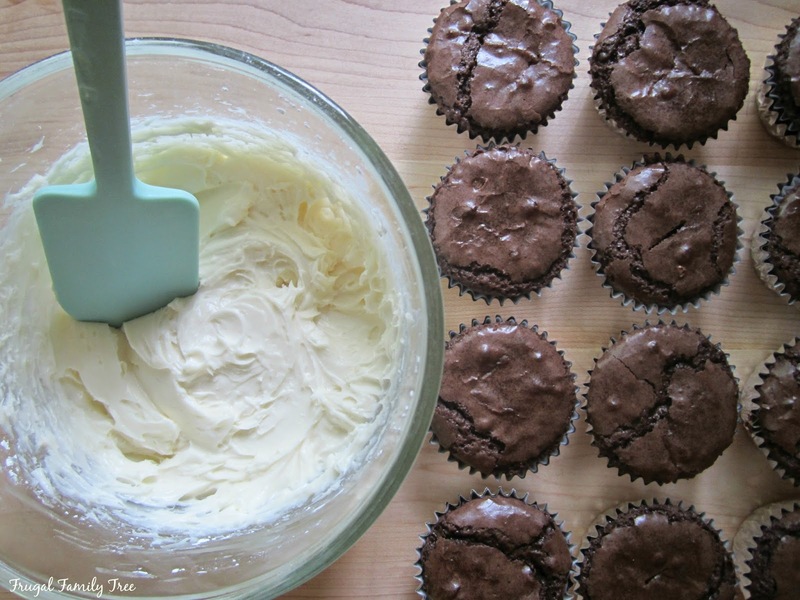 Line a cupcake pan with paper liners. Melt butter in a small sauce pan, then pour into a medium bowl. Add cocoa powder and stir until well combined. Add eggs and stir into mixture. Stir in vanilla, flour, and salt. Do not over mix. Fill liner with batter 1/3 full. Drop in chopped TWIX pieces, and fill about 3/4 full. Bake 20-22 minutes. With an electric mixer on medium-high speed, beat cream cheese, confectioners' sugar, and vanilla until fluffy. 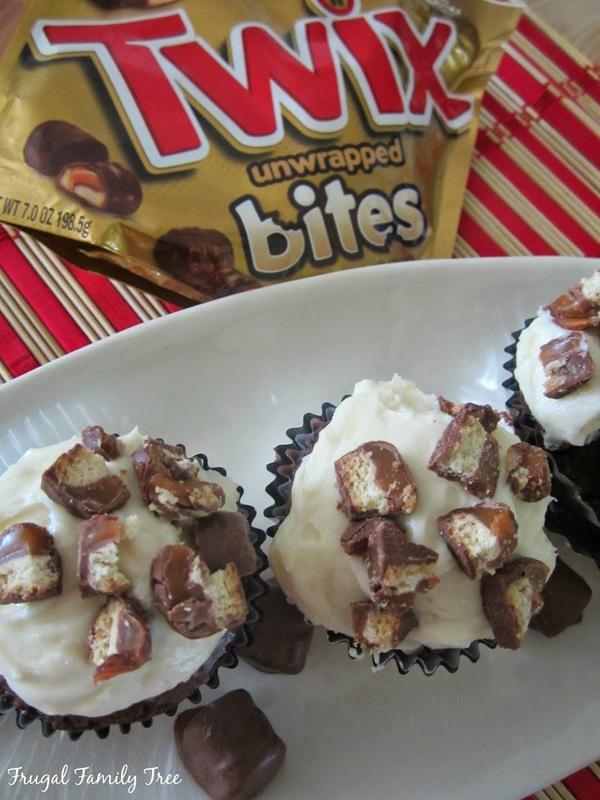 Spread frosting on top of cupcakes when they are cooled, and top with chopped TWIX pieces. The cupcakes ended up tasting super good, so rich and chocolaty, and with TWIX as a delicious center. My family and I ate them for dessert that night, and I snuck one for breakfast the next morning! This really is an easy recipe, and well worth the effort of making brownies from scratch. They can also be made with the other varieties of candy, and I'm thinking I'll make them with Snickers Bites for my grandson's end of the year barbeque. I'm sure they would be a hit with the kids and the parents, too. You can find all four varieties, including TWIX Bites, at your local Walmart. There is also a great coupon at Social Twist that lets you save $1.00 off when you buy two 2.83 oz. or larger bags, or $3.00 off when you buy two 6 oz. or larger bags. What a great reason to #EatMoreBites, right?